Advent (meaning coming) reminds us that, in love, God has come, is coming, and shall come to us in the person of Jesus, our Savior. Advent services are held on the four Sundays preceding Christmas (meaning festival or mass of Christ)---the celebration of Jesus' incarnation and birth on December 25 (and, in some traditions, for a total of 12 days). Following Advent/Christmas comes Epiphany (meaning revealing), which reminds us that the Savior of humankind is none other than Jesus of Nazareth---the Son of God incarnate; God and humanity (two natures) united in one person. Epiphany services typically are held the Sunday prior to the day of Epiphany (which falls each year on January 6). These services focus on the revealing of Jesus to the world—typically highlighting either the visit of the Magi to honor the infant Jesus, or the baptism of Jesus in the Jordan River. Both of these events reveal profound truths concerning Jesus’ identity. In this post I'll focus on Jesus' baptism. In the Gospels, a climactic moment of the revealing (epiphany) of Jesus to the world occurs at his baptism in the Jordan River. Jesus is about 30 years old, and his public ministry is about to begin (Luke 3:23). His cousin, John the Baptist, announces the Messiah’s coming and urges fellow Jews to respond by being baptized to signify repentance and forgiveness of sin (Mark 1:4). 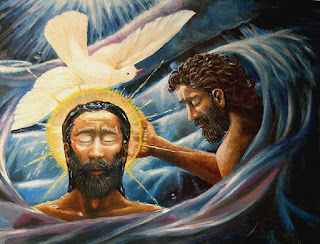 Upon hearing of John’s message and ministry, Jesus leaves his home in Galilee, travels to the Jordan River, and submits himself to John’s baptism. [Jesus] stands with…a sinful people in need of a genuine act of repentance. Jesus, in coming to be baptized with John’s baptism, is not unlike Daniel, a man of God, himself above reproach (Daniel 6:4 KJV), but who at a time of national crisis fell on his knees before God and made his confession to God as if he were as much at fault as his people. He prayed: “We have sinned and done wrong and acted wickedly and rebelled…We have sinned against thee. [Yet] to the Lord our God belong mercy and forgiveness” (Daniel 9:3-9 KJV). First, the heavens are “torn open” (Mark 1:10). The language is cosmological—the barrier between heaven and earth; between divine and human, has been breached! Jesus’ ministry to save is advancing! The ancient prayer asking God to “rend the heavens and come down…to make your name known” has been decisively answered (see Isaiah 64:1-2)! Second, the Spirit descends on Jesus in “bodily form” (Luke 3:23) “like a dove” (Luke 3:22). Why a dove? Apparently, because of its association with Old Testament imagery—at creation (Genesis 1:2) and at the delivery of the world from the judgment of Noah’s flood (Genesis 8:8-12). Now the Spirit is involved with Jesus in new creation—and the Spirit comes upon Jesus in a way unlike any person before. The man Jesus, uniquely, is “full of the Holy Spirit” (Luke 4:1). Third, from heaven comes the reassuring voice of the Father, declaring to Jesus, "You are my Son, whom I love; with you I am well pleased" (Luke 3:22). These words echo Psalm 2:7 and Isaiah 42:1. Though other people have been called “God’s son,” never before has one been called God’s “beloved [only] Son.” With these words, Jesus is shown to be God’s unique son—the one who has a special and unparalleled relationship with the Father. With Jesus, the Father is “well pleased,” a phrase which means that the Father takes “great delight” in Jesus. For all eternity, the Father has taken great delight in his divine Son. Now at his baptism, the Father bears witness that Jesus is, indeed, that Son. At his baptism, Jesus, the incarnate Son of God, steps forward and, on behalf of us all (as our representative and substitute), is anointed by the Holy Spirit and commissioned by the Father for his ministry (see Acts 10:37-38). God is with us (Immanuel) and now ministering among us, including being baptized on our behalf. As a result, a new day has dawned, a new creation has begun. Let us rejoice! For additional thoughts from GCI on the meaning of Jesus' baptism, click here. For a helpful analysis of T.F. Torrance's thoughts about baptism as it relates to the vicarious humanity of Jesus Christ, click here. For resources from GCI and others related to celebrating Advent and Christmas, click here.